This campus is held weekly from Monday to Friday and has a time of 9:30 a.m. to 2:00 p.m. with a break of half an hour. In it we take care that the students discover their favorite water sports among all the offer of our school. 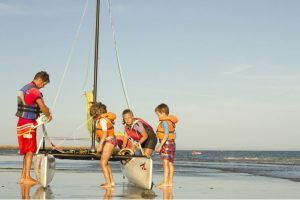 We practice windsurfing, catamaran, paddle surfing, big paddle, kayaking, surfing, kite initiation, marine swimming, beach boley. We form groups of between 5 and 20 children and the maximum ratio is 8 students per instructor. The main activity is windsurfing or catamaran, which they do every day for two hours if the weather conditions allow it. The chosen course will be the standard course established in the school, so it is expected that they learn to navigate with ease. In the other two hours they do the rest of the activities we offer at school: Windsurfing, catamaran, paddle surfing, big paddle, kayaking, surfing, kite initiation, marine swimming, beach boley. In the second modality, they will be tested so that the student can experiment if they would like to learn it in the future, taking advantage of the weather conditions.